Over the last week or so I've been writing up my recollections of the BBC's web search, which was launched in the early part of this decade. In January, having survived both a 2004 DCMS and a 2008 BBC Trust review, Seetha Kumar announced that it was finally being removed from BBC Online. 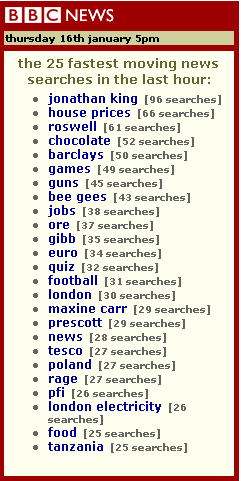 Today I want to look at how the BBC marketed the ability to search the web from bbc.co.uk. The web search service initially had a big promotional push from the BBC. At the time, the trails that you saw between programmes on the BBC's television channels were divided between the 'twelves' and the 'forties'. Each month saw a focus on one service or product - a 'twelve' - and then another forty services or programmes were promoted on air during the year in secondary slots. New media generally only got one big 'twelve' slot a year. The BBCi re-brand in November 2001 was promoted with the 'More power to your finger' television campaign at launch. The following summer, web search was the new media service to get the coveted marketing slot. However, the campaign was a disaster. Just a few days prior to the launch of the service from the BBC homepage, I can remember the whole team huddled round a TV screen in Mortimer Street to watch the DVD of the advert that was about to be unleashed on the nation via BBC One. The web search service had been built using user-centred design principles, with the strategic aim of making the BBC homepage a place that fulfilled the BBC's charter-bound remit to be a 'trusted guide to the web'. It was about providing novice Internet users with a safe place they could start exploring the Internet. The unique selling points that differentiated it in the market from other search engines were a strict UK focus, and that it did not include advertising or commercially paid-for links. It was continuously monitored to be pr0n-free, and the interface design was conceived to be reassuring. It was aimed at 'Gayle', a mother of two in Bromsgrove, who wanted to use the Internet to help her kids with their school-work, but was worried about scare stories in the media. "The aim of the BBCi 'The search is over' campaign is to drive awareness and trial of BBCi Search among under 35s. The two witty TV executions present a frustrated internet user venting their anger on their PC." The campaign was launched on May 4th 2002, and appeared on BBC One, BBC Two, with radio spots on Radio Four and Radio Five Live. It was inevitably truncated because of the number of complaints received by the BBC that the trail was either disturbing to younger viewers, or that it trivialised domestic violence. It certainly did very little to convey the key product concepts of 'safe and friendly'. I was involved in several initiatives to promote the service internally at the BBC. 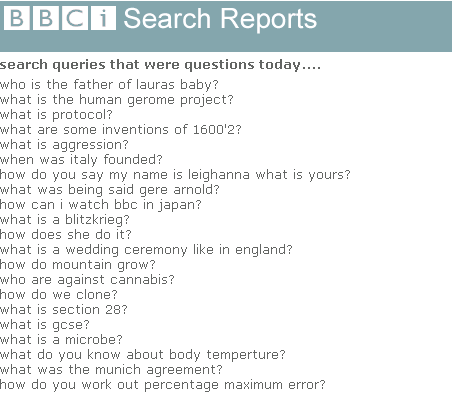 One of the systems I was encouraged to develop was the ability for anyone within the BBC to subscribe to an email update of what were the 'trending' terms in search. Daily or hourly they could receive an email which would tell them the search terms that were growing in popularity across either the whole of the BBC web site, or just the news portion of it. 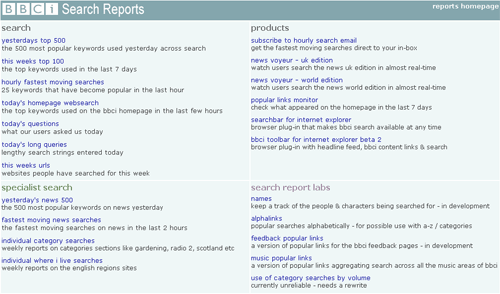 This was part of an entire 'dashboard' for monitoring search that I built for the BBC's intranet. 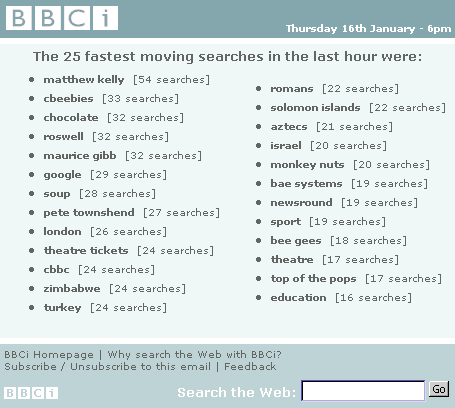 Anyone within the BBC could quickly check the most popular 500 search keywords on the previous day, the week's top 100 searches, or 25 keywords that were growing in popularity in the previous couple of hours. As well as that, some of the reports were specifically geared to particular areas of the site, with bespoke reports for each of the English regional 'Where I Live' sites, top-level categories, and BBC News. There were also some reports pulling out search queries that had been phrased as natural language queries, very long search queries, and the URLs that had been directly typed into the search box. All of the reports were generated by combining my own very basic Perl scripting with the work of our proper software engineers, who delivered and rotated the search log files for me so I could handle them in a manageable fashion. Given that I was a producer, not a member of the software engineering team, I had an account on a scratchpad-type development server - the reports were hosted at the somewhat user-unfriendly address of bol-dev.bu.bbc.co.uk/martinb. And through naive programming I managed to knock the server over with a regularity which must, in retrospect, have really grated. I think one of the chief problems for the service was that the BBC didn't want to appear too aggressive in the marketplace. I spent some time working on "search syndication" products designed to increase the reach of the service, but due to a very cautious approach, admittedly in part by me, they never went public. I've blogged before about the BBCi Toolbar, which was intended to be an add-on to Internet Explorer 6, allowing the user to access BBCi web search direct from their browser, and put direct links to BBC content into the browser furniture. It was deliberately ugly so that nobody internally would get so excited about it that it would be launched without a thought, but it never saw the light of day outside the BBC at all. These days, I'm almost certain I could have slapped a 'Beta' tag on it, written in the FAQ that it sometimes crashed horribly on a particular combo of IE and Windows, and promoted it via something like the backstage.bbc.co.uk list. And released the source code asking someone to volunteer to fix the bit that went wrong during the install. And faced a barrage of criticism for not having simultaneously developed non-Windows version of it. The BBC wasn't like that in those days, and every step with syndicating BBC-badged web search was dogged by lawyers and second-guessing how it might be received by other media sites, search engines and regulators. Other plans included a version of the toolbar that was purely focussed on search, and a way to allow websites to embed BBCi Search boxes in their own sites. In the next part of this series I'll be writing about some of the unhappy external reactions to the way that the BBC presented web search results. By Martin Belam on 2 April 2009.